Requirements for a Flag State Endorsement by the Palau International Ship Registry (PISR) in accordance with the provisions of the International Convention on Standards of Training, Certification and Watch-keeping for Seafarers, (STCW) 1978 as amended. An applicant for issuance of a Certificate of Endorsement shall submit a properly completed application. The latest revision of all forms of applications is available on the PISR website. When an application for an PISR endorsement of a COC is submitted to any Regional Office, the applicant may request issuance of a Certificate of Receipt of Application (CRA). A CRA, in conjunction with a valid national COC, allows the holder to serve on board a ship entitled to fly the PISR flag, for a period not exciding three months. 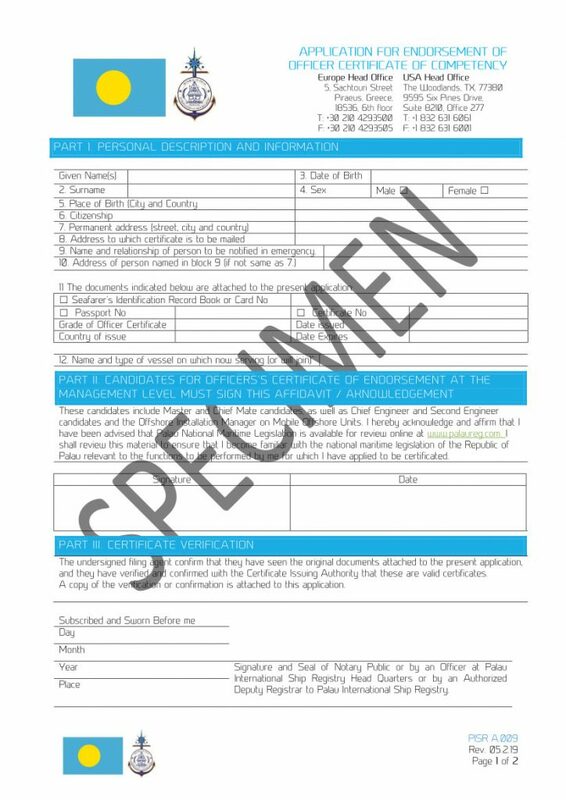 application (with attachments) and proof of foreign certificate are in order, the applicant will promptly be issued a COE on PISR form. Every navigational officer serving aboard a PISR registered seagoing vessel need to hold a valid COC issued by a recognized flag administration. A relevant COE issued under the provisions of STCW, will remain valid for the unexpired term of the national certificate that has been dully recognized. Certificates issued pursuant to the above paragraph may be limited by endorsement to service on vessels of not more than 3000 GT. Such certificates may be further limited according to the candidate’s actual experience and qualifications as appropriate. 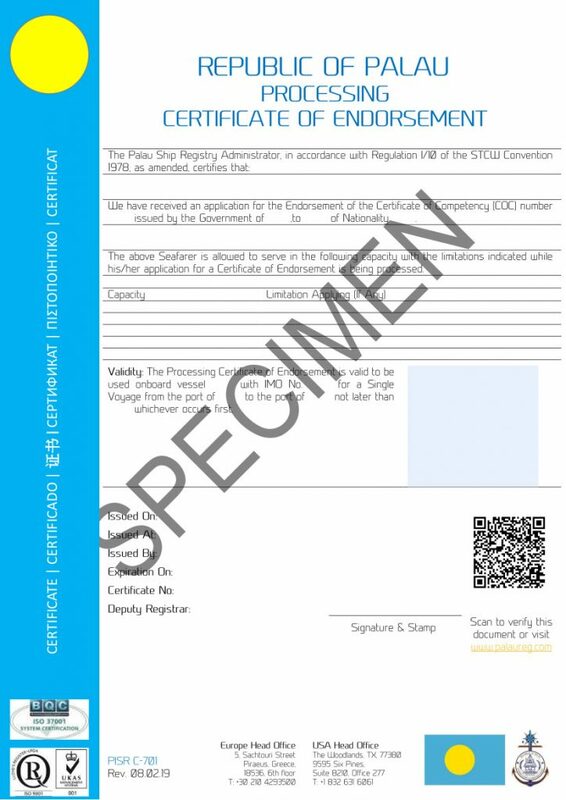 Every Engineer or Electro-Technical Officer serving aboard an PISR registered seagoing vessel shall hold a valid COC issued by a recognized flag administration. A relevant COEs issued under the provisions of STCW will remain valid for the unexpired term of the national certificate that has been dully recognized. A certificate issued pursuant to the above paragraph may be limited as to tonnage or power rating of main propulsion machinery, or both as appropriate. Every Officer serving aboard an PISR registered oil, chemical and liquefied gas tankers shall hold a valid CoP issued by a recognized flag administration. A relevant COEs issued under the provisions of STCW will remain valid for the unexpired term of the national certificate that has been dully recognized. Each COE is valid for a period of up to five (5) years and is subject to renewal under the conditions set forth in these requirements. All PISR certificates are the property of the Administration. They must be in either the possession of the seafarer to whom they are issued, the Administration, or en-route to the seafarer. 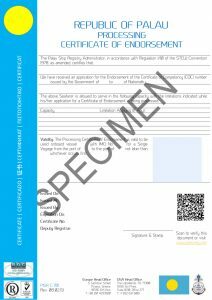 Any certificate may be renewed within 12 months prior to the date of its expiration. The holder of a certificate that is stolen, lost or destroyed may apply for its replacement, valid for the unexpired term of the original certificate, by submitting to the Administration an affidavit in writing or affirmed before the Police, a Deputy Registrar, Special Agent; the affidavit must state the circumstances of the loss or destruction and give a description of the certificate. 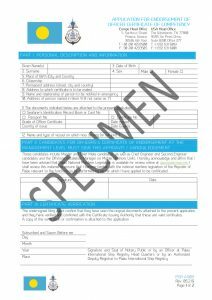 COEs mailed by the Administration that are not received by the filing agent will be replaced at no additional charge; however, such replacement certificates will be sent by courier and the filing agent may be responsible for the courier charges.